Organising a children’s party is, at the best of times, a headache. There’s a lot of pressure to pull off the best event that all the kids will be talking about for ages, for the right reasons. Sometimes it can be tempting to try and throw the biggest, flashiest bash you can, but keeping things low maintenance doesn’t have to be boring. Our quick tips will mean everyone’s a winner. Unless you’re tied to a specific occasion, schedule your children’s party during the summer so that you can hold the bulk of activities, if not the whole thing, outside in the garden. This is tip number one for a low maintenance event – any mess the little darlings make will be well away from your new carpet and your pets will remain at peace. The kids will also be safe in your garden – if in the unlikely circumstances that you don’t have children of your own, just make sure the space is child-friendly and any access points are well secured. Keeping food low maintenance is also a piece of cake. Opt for finger food, like mini pizzas, bite-sized wraps and anything else that your little guests can simply grab and munch. No need for cutlery, stuff on sticks or anything that needs further preparation. Where drinks are concerned, stick to cartons of juice rather than jugs of squash that could be knocked over. For sweet treats, go for cupcakes or biscuits rather than a larger cake that needs cutting up. It’ll only end up being hacked to pieces and you’ll end up throwing away the leftovers. So to low maintenance children’s party entertainment. The idea is that the kids keep themselves amused while you and the other adults enjoy a cold glass of wine and some grown up chit chat. One good idea is to hire a bouncy castle, guaranteed to provide hours of fun with fairly minimal supervision. You could also investigate the option of a children’s entertainer, for example, a magician. Add some music and some fun games and a good time will be had by all. When you plan party bags for your guests to take home, make them easy by putting together identical packs to avoid any squabbling. Hand out the bags as each child leaves so that you don’t end up having to send any left overs on to their recipients. It’s a good idea to set a fixed end time for a children’s party so that you know when your home will be your own again. Try to enlist a few other willing parents to help you clean up and order will soon be restored. Holding a low maintenance children’s party isn’t too tricky as long as you stick to a plan and don’t cave in to the pressure of keeping up with the Joneses. 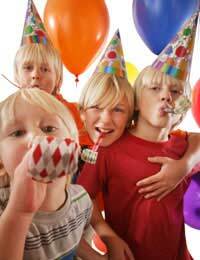 Remember our own parties when we were kids? How simple they were, and how we still treasure those memories today.